Beekeepers have been trying to weigh their colonies since the invention of the movable hive, and those who keep records are endlessly fascinated by the fluctuations in hive weight during the year, especially the rapid increases during a nectar flow. Stories abound of hives gaining hundreds of pounds per week in some areas, something we never see from the outside looking in. From a practical point of view, keeping track of your hive’s weight lets you know when your bees have enough stores for winter, when brood rearing is in full swing, and when a nectar flow has begun. A rapid decrease in weight might alert you that a nectar dearth is underway, a swarm has issued from your colony, or robbers have invaded. A slow decrease may mean your colony has stopped storing honey and begun eating it. Whatever the case, the information gives you a head’s up that something is changing inside your hive. Until recently, finding a good scale was hit or miss. I’ve seen all kinds of rusted hulks picked up at garage sales or company liquidations that beekeepers have hauled home and used to measure their hives. Some look rickety, like old bathroom scales, and some appear massive enough to weigh your car or even your blue-ribbon sow. Surely, there had to be a better way to weigh. Luckily, Rich Morris and the BroodMinder team have been working tirelessly to design a simple to use, lightweight, purpose-built hive scale that sends the data wirelessly to your phone. The new scale, called BroodMinder-W, is the first scale I can actually visualize myself using—one that isn’t impossibly ugly and finicky, and doesn’t require chains, hoists, or a fork lift to set up. The scale itself is only 16.25” x 2.5” x 1.5” and fits under one end of your hive. You prop up the other end on a piece of wood and you’re good to go. The measurement is simply doubled to give you the full weight. Bluetooth Low Energy communication, no wires, no setup dance. It just works! Yes, other hive scales have recently come on the market, but I trust the folks at BroodMinder to build a superior product and, most importantly, to stand behind their products as they have in the past. Even more compelling, you can choose to store your data for free in the cloud if you agree to allow public access to those data. 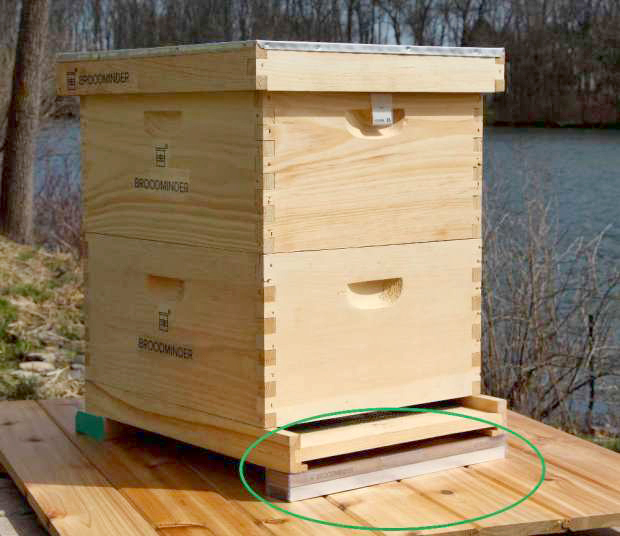 This simple step means that your hives and your data become part of a much larger movement to collect information and gain insights into how we can best protect the health of honey bees in the future. The more we know, the more we can help. By contributing your data to the pool of information, you will be helping the future of beekeeping and the future of honey bees worldwide. As a contributor of data, all the collected information is available for you to use. Visit the BroodMinder-W Indiegogo campaign where you can order a scale for $149 plus shipping. Some units are still available for the earliest ship date in June, otherwise you can order for July or later. If you don’t already have the BroodMinder-TH, the in-hive temperature and humidity sensor, you can get a special package price of $199 for both products. Please note that I get asked to promote products nearly every week, but I seldom do. In fact, I’m still taking heat for not recommending the Flow hive . . . you wouldn’t believe the virulent e-mails I receive! Nevertheless, I endorse BroodMinder because of the company’s sincere desire to help beekeepers, their high-quality products, the depth of their research and development, and their willingness to stand by their products if things go awry. Weigh to go, BroodMinder! Weigh your hives: In this photo you can see the BroodMinder-W scale under the front of the hive, and the BroodMinder-TH tab peeking out from under the telescoping cover. No ugly parts to be seen! Funny! That is exactly the look I’d like to avoid! Looks really useful like the temperature sensor was. I’m assuming like before that this is not available to your UK beekeeper brethren? What about needing a tilt to avoid water flowing into the hive? How would it considering that aspect? Most people now use screened bottom boards, so tipping isn’t necessary. A honey bee colony needs tremendous numbers of flowers in order to make honey. You can’t get a whole crop of honey from just a tree or two, but it certainly helps. The bees will add the nectar from those trees to other nectar they find to make their honey. I would absolutely love to use this hive scale. I’d love to have about 6 of them in fact, but I wish they were a little closer to my price range that I could afford. I’ll keep an eye on them for sales or price drop and then pick a few up. Thanks for the info on them! I think I’m going to go with just one, and use it as an indicator for the whole apiary. At least that why I will be able to tell when the nectar flow is on or not. But yes, I certainly understand your view. This looks like the first real practical version that I’ve seen. I’ve ordered the full set for one of my hives in south London UK. I hope it arrives before the main honey flow – I’d love to see it build up. We will be announcing the availability of a Wireless Hive Health Monitoring System later this month that uses a scale with this design. Our original scale was a full scale that worked quite well, but did not meet my cost goals. My goal is to bring the cost down to the point where a health monitoring system can be economically justified. The good point of one-side lifting scale (say OSL scale) is simplicity in construction and price. OSL scale however cannot show the actual weight of the hive because weight depends not only on angle of inclination but also on frames direction relative to scale and in some cases also on the number and distribution of frames (general case). So the OSL simplicity is payed with a lot of bad features: weight is scaled down by factor that depends on specific hive in time i.e every hive weight have specific scaling factor that easily changes as you rearrange frames and so on and on. The real scale would lift both sides and get the real weight with all the benefits that comes from that. Hi Slavne , did you manage to put up your solution on line? Please find my message downwards to get the link. In order to weigh one of my hives, I’m considering either the BroodMinder-W or a platform scale. Have you been weighing your hives regularly with the BroodMinder-W since this post was published? Have you found the data useful and worth the price of the device? Can the data be downloaded and manipulated on a PC? Have you encountered any issues? Thanks. You have to understand that I do a lot of experimentation to give me material for posts. I’ve used the Broodminder-W for different purposes, depending on my inquiries. But yes, you can download and manipulate the data. Also, if you submit your data to their site, you can see data from all across the country to use for comparison. This thing I like about it most is I can move it from hive to hive relatively easily by just jacking up one end of the hive with a board. I don’t have to move the whole hive to move the Broodminder. I haven’t had any issues with it, and the company is very responsive if you have questions. Just my two cents; I’ve never used a platform scale. Sorry for my late reply, I was in the fields far from my computer. Thank you for asking I managed to obtain the solution that I have been using this year with large satisfaction. The purpose of my construction is to give enough precision for RELATIVE hive measurement. That means I compare today’s weight with any previous weight in the past to see what is happening in the hive. IMHO the achieved precision is by far better then other relative measurement solutions I surveyed. In the article I gave my view of the principles of measurement and construction of both my solutions as well as foreign ones. The most important practical aspect I learned about my weight device is it can be carried with one hand, compact to fit small market bag, say less then 2kg. In the article it says achieved precision is 10g and it should say no worse than 100g to be on the safe side, although I personally almost always get up to 10g precise repeatable result. I also carry a small carpenter’s clamp to fix my scale to the hive support in order to achieve such precision.